Since a visit to Pugin's house and church in Ramsgate, I've had the picture of these roundels (above) on my wall to remind me about good stained glass design. They are from a series in the cloister of St. Augustine's Church, and were designed between 1846 and 1858 either by Augustus Pugin or his son in law John Hardman Powell. Their design shows how Pugin used plant forms as flat patterns to fill up the space they were intended to enrich, keeping them formalised and abstract rather than three-dimensional. As our guide to his house, The Grange, commented 'no Pugin, no William Morris'. The church interior is fabulous, both in terms of the integrated design details and furnishings and, as we were invited to notice, by the way that every view is interesting. The layout is unexpected, the windows are all spectacular and full of meaningful details. In the three pictures above, I have tried to show them in their architectural context. The top lights were all made in 1848 and 1849, while the lower panels are from the 1850s and 60s. Pugin died in 1852, like the roundels the later lower panels were designed by John Hardman Powell from the firm Hardman of Birmingham who were the makers of Pugin's stained glass from 1845. Seeing Pugin's wallpaper design somewhere had made me want to visit the house. The scraps that have been found and preserved (above left) and the version that has been reprinted and hung in the hall all use great colour combinations. The colours continue in the painted borders in the chapel, and the bird pattern reappears around a stained glass map of Thanet in a sitting room window. What I like about this house are the details and the links between the decorative finishes. Pugin's two sons, Edward and Peter Paul, became architects too, and made alterations to the house and church. 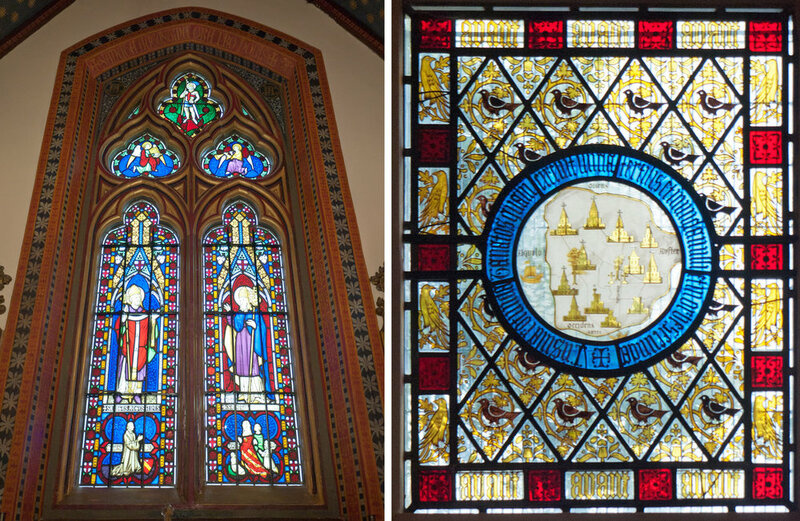 They are shown in the bottom of one of the chapel windows (below), the other one (above) shows Pugin on one side and his third wife and daughters on the other in traditional pose and in clear, bright colours.